I was extremely skeptical about this recipe, so much so that I decided to just slice a single orange and a few slivers of onion to test this recipe solo at lunch. 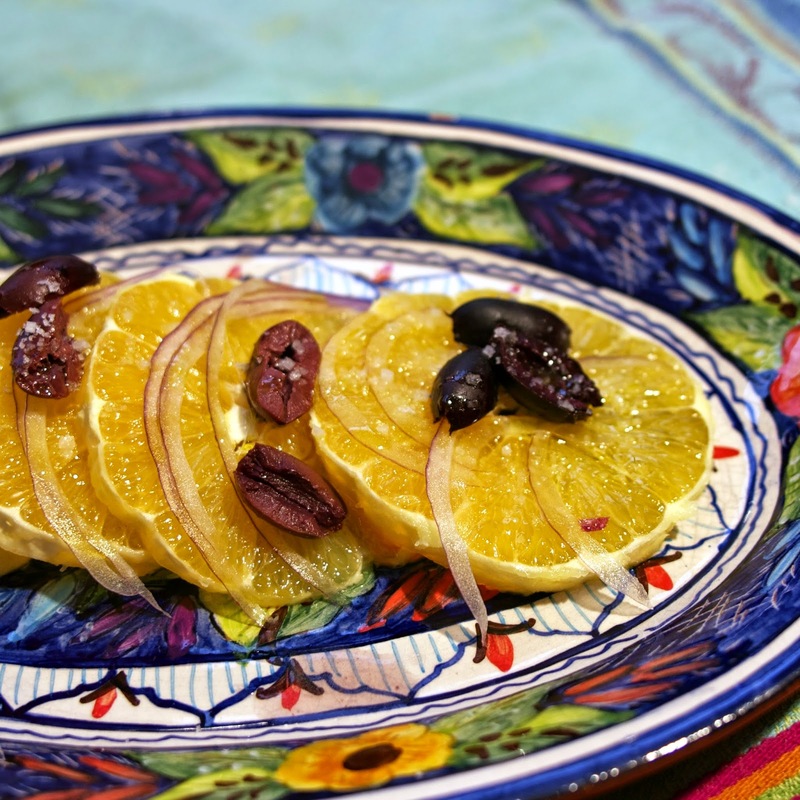 Now I'm a Mediterranean girl and I love olives and onions, and oranges are terrific in season but the thought of putting these three ingredients together with olive oil and salt... just seemed odd. By American sensibility this salad is odd. Let's face it we are not adventurous with salad: lettuce, tomato, croutons with some Ranch or Blue Cheese dressing remains the American way to "do salad." I went back to the recipe with a partically open mind. Following the directions I soaked some sliced onions in water for 20 minutes as Dorie recommend. I did a before and after taste test. I didn't find much difference in the flavor. The soaked onion was slightly less bitter and slightly more crisp, but not enough to make this step worthwhile. I felt the need to use a red onion, one because it is what I think of in Mediterranean salads and two because a yellow onion other than a Vidalia would be really bitter. I didn't really work to remove all of the white on the orange because the white contains seriously beneficial bioflavonoids... the health benefit of the white peel is my excuse for my laziness toward removing it. I used jarred pitted Kalamata olives because I rarely see Nicoise olives in stores. I did break out my fleur de sel salt and my extra good quality olive oil that I bought with Betsy when we had our NYC get together this summer. The result... fabulous. 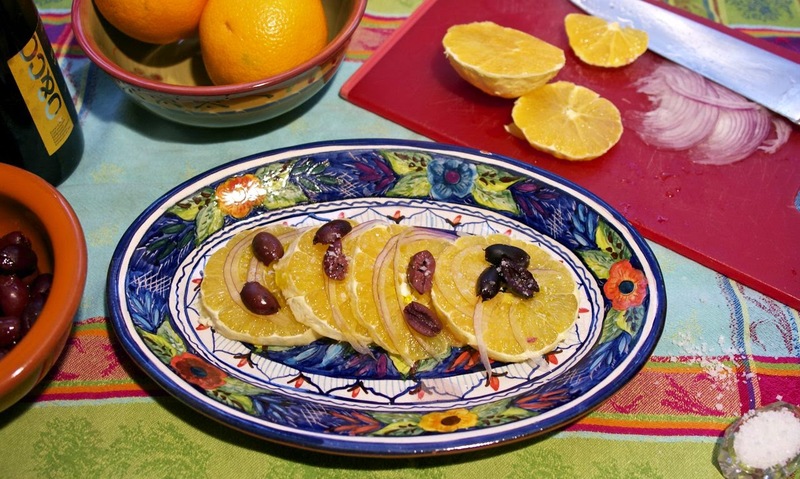 The orange acted like a built in astringent creating a sort of salad dressing with the olive oil. The bitterness of the onions balanced the saltiness of the olives, and the olive oil and fleur de sel smoothed out all of the flavors. Make this salad for company this winter. It will stimulate conversation, it looks good, and everyone will be impressed by how good it tastes....and it's just so easy to make! This recipe has your part of the world written all over it. You probably have terrific olives too. Enjoy. HI Diane, I am always looking for a new salad, looks like this got great reviews. This is truly not a a same old, same old salad. It is perfect for the winter when citrus is in season. Love this salad, it's so different with incredible & unexpected flavors. I've been making something similar for years and everyone is skeptical until they taste it. You have to trust the French, right Sam? LOVE your paper thin onions! I enjoyed this one, too! Merry Christmas!!! yes, they worked well. Merry Christmas. Looks delicious Diane! I can't wait to make it. Kalamatas were definitely the olive for this salad. I think I'll make 'fruit cups' with this combination for whenever that sweet/salty craving hits. Fruit cups is easier for serving, but I do like the slices. First, I am rethinking the "white" part of the orange. I can neither pronounce or spell "beneficial bioflavonoids" but they sound as if they HAVE to be great for you. So, okay. I also did the exercise of the mandolin, with great results this time. During my last effort I donated a bit of my finger tip to the process. I also agree that only red onions should be used. It's prettier. I liked this salad very much. Always seem to have this stuff hanging around my pantry, fridge and fruit bowl, so will make it again and again, I think. This salad will be added to my regularly made list, along with Dieter's Tartine and Cafe Carrot Salad. I fully enjoyed this salad as well ... with a piece of baked cod, it was perfect for a winter's lunch. I made the Bonne Idec version, though, so no olives, but I'll try that soon, too. Cod sounds terrific. I can't wait to try this with a tagine. Glad you enjoyed this salad. It just wasn't for me - the salty olives with the citrus flavour was not something I enjoyed. Glad you got to use the Oliviers Olive Oil. What a great store. Did you ever go back for the early season kind of oil that they were out of when we were there? I have to say I didn't enjoy this one as much as you do, though I'm normally an adventurous salad eater. Your comment about most American salad eaters brought memories of when I used to travel frequently to the Detroit area. I did a thorough survey of restaurants, while searching for healthy food to eat, and 99% of the time a salad was a wedge of iceberg lettuce, one slice of cucumber, one ring of green pepper, maybe one ring of red onion, and if lucky, a wedge of rock-hard, ice-cold tomato. So sad. I hope you have a Merry Christmas! No, I have the name of the oil and they said it comes out in January. Hopefully I will get into the city for it. It is really amazing. Happy Holidays to you Betsy. Glad you got to know your slicer better now! What a delightful post, enjoyed it (ie your post) and the salad too! Thanks Emily,,, enjoy the season. Happy Holidays. I was also pleasantly surprised at how much I enjoyed this salad, Diane! I grew up on Tabouli…it ruined me for those iceberg type salads forever! 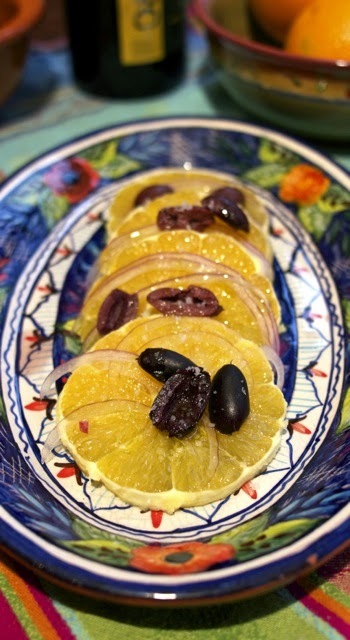 I used oil cured black olives on mine…perfect! Your salad looks so pretty! Love that gorgeous plate! The plate is from my honeymoon in Portugal. All the dishes I got from that trip are very special to me. Pretty photos, Diane, and that plate is gorgeous! I laughed out loud at the finger remover/mandoline comment. After a trip to the ER last year I got rid of my mine because I took too many chances with it (and it wasn't a very good one anyway). Merry Christmas!! I am such a disaster with kitchen appliances. I'm not sure you were cooking with us when I exploded the blender and my inversion mixer short out and shocked me. I think I need to do Amish cooking next. Modern gadgets and me just don't get along. Merry Christmas. I am glad you enjoyed this one. I liked my soup that I made. I agree with your sentiments on the raw onions. Happy holidays. This salad was a pleasant surprise. (I used clementines and didn't even try to remove the white part - that would have driven me nuts). I don't remove white nor do I peel carrots...just doesn't bother me. Merry Christmas. Isn't it wonderful when a recipe surprises you like this? I'm looking forward to serving it to guests some time. It will be a delicious conversation piece. I hope you're enjoying the holidays. Happy New Year! I've decided to make it for my New Year's Day brunch. Delicious thanks for sharing with Hearth and soul blog hop. I just love this salad! Thanks so much for sharing this awesome recipe with our special edition of Full Plate Thursday. Hope you are enjoying your holidays and look forward to seeing you soon! Love this!! Thank you so much for linking up at Tasty Tuesday! Your recipe has been pinned to the Tasty Tuesday Pinterest board! Please join us again this week! You're not kidding. I've made this 3 times already. Interesting experiment with soaking the red onion. I'm glad to know I can skip that step in the future!